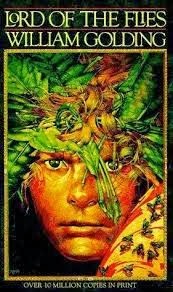 Summary: A group of young boys is marooned on a deserted island and must learn to survive not only against the elements and provide for their physical needs, but against their baser natures as humans. This book was craaaaazy. It wasn't a page turner for me, and actually took me a while to get through because it wasn't one that kept me on the edge of my seat or was super entertaining for the first while. The setting is the same throughout the whole book, so about halfway through I got a little bored and was tempted to not finish it (I'm the worst at not finishing books). I kept going though and am so glad I did. I don't want to say too much about the book or give anything away, but it really is a story about how, on our most fundamental level, there is good and evil to just about anyone, even at a very young age; and when you are stripped of all social convention and polite society there's no telling what will come out. Also, the mob mentality in the book is really interesting. I would have given it a higher score, but for the fact that it is pretty slow for a while. It's a pretty dark book and really sad at parts so if that isn't your cup of tea, I wouldn't recommend it. If you are intrigued by human nature and it's different mental states like I am, you will love it. I'm so sick of cleaning up poop.